When learning about the IELTS exam, my students often ask me what IELTS score they would need to get into a particular university or organization. what level of study you are applying for: a student entering a Masters degree will usually need a higher band score than a student entering a Bachelors degree. what subject are you planning to study: subjects with lots of technical language, such as medicine, will require a higher band score than a subject with less technical language, such as history. Subjects like law and accountancy will come somewhere in between. what kind of visa do you need: a student visa usually requires a higher band score than a work visa, and a working visa usually requires a higher band score than a residency visa. what kind of organization you are applying to: is it an educational organization, a multinational company or a professional organization. 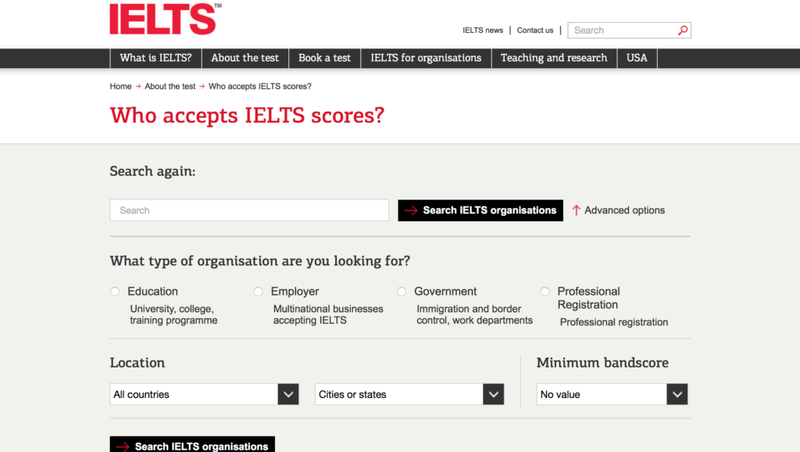 Fortunately, the IELTS organization can help you find out what IELTS score you need for all these things. Click on the picture below and you will be taken to the official IELTS website where you can search and browse organizations by category and by location. You will get results like these below for educational institutions in London. On the right you can see the minimum IELTS band score needed to enter the university. Of course, you will need to contact the organization directly for more information and a more accurate IELTS score requirement, but this search will give you a better understanding of what you need to achieve when you start to prepare for the IELTS test. For some great preparation tips, read my article How to prepare for the IELTS test. If you found it useful, please share it by clicking on one of the share buttons on the page. Thanks!